Posted April 26, 2018 in Diet Management, Featured Post, Tips, Tags: amaranth, ancient grains, grains, grains in kdiney diet, Kidney Diet, millet, phosphorus in grains, potassium in grains, quinoa, renal diet, whole grains, wild rice by Erika Stahl, RD, CSR, CNSC. There is confusion around whole grains and ancient grains in the kidney diet. The reason is changes in renal diet goals and guidelines. Read on to learn more about current kidney diet recommendations for grains. Up until the last several years, renal dietitians have recommended that people with chronic kidney disease (CKD) avoid whole grains. This is due to higher potassium and phosphorus content compared to refined grain products. Whole grains have many healthy attributes. They are good sources of vitamin E, which can help protect the brain from signs of aging2. 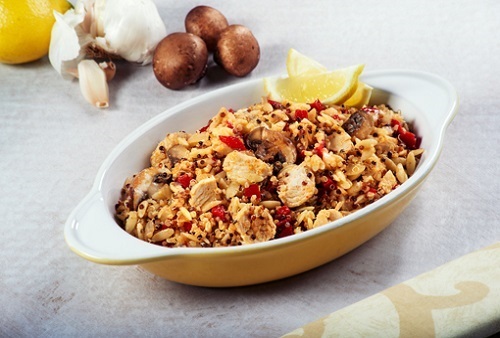 Whole grains also may help protect the body from developing chronic diseases such as heart disease and diabetes. Most importantly, whole grains provide fiber. Fiber is beneficial as it helps to regulate bowel movements. Thankfully, as more research has become available, recommendations regarding whole grains have changed. What we know now is that whole grains can be safely incorporated into a kidney friendly diet. This can de done without significantly increasing levels of potassium and phosphorus in the blood. Why are Whole Grains Allowed Now? Whole grains are higher in phosphorus than processed grains. However, the phosphorus in whole grains are bound to a molecule called phytate. In order for the phosphorus to be released from the phytate bond, an enzyme called phytase is needed. Without the phytase enzyme, there will be decreased absorption of phosphorus from the whole grain food. The amount of phytase enzymes in whole grains gradually decreases with time, during milling of whole grains, and during food preparation. Some grains have very little to no phytase activity including oats and millet. Therefore, whole grains may have high phosphorus composition but the likelihood of absorbing that full amount of phosphorus is low. In fact, it is estimated that only 20-50% of the phosphorus consumed will be absorbed. For example, one cup of cooked oatmeal prepared in water has 180 mg of phosphorus. But due to the low amount of phytase enzymes found in oats, only 36-90 mg would actually be absorbed into the bloodstream. Oatmeal lovers rejoice! 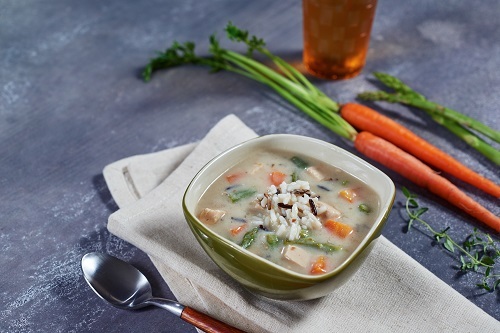 If you don’t enjoy oatmeal, or are looking to try something different, consider adding some other whole grains to your diet. Whole grains such as amaranth, millet, quinoa and wild rice are sometimes referred to as “ancient grains”. These grains were enjoyed by many people around the world centuries ago. Today their popularity is making a comeback. Amaranth is a gluten-free grain with a crunchy texture and a nutty peppery flavor. One half cup of cooked amaranth provides 4.7 g protein, 2.6 g fiber, 182 mg phosphorus, 166 mg potassium, 2.5 mg iron, and 1 mg zinc. Amaranth is best used as a breakfast food. Millet is a gluten-free grain popular in South America, as well as India, China, Russia and Nepal. It can be found in a variety of colors- white, grey, yellow and red. Millet is a great choice for people with kidney disease as it is high in antioxidants. It has little to no phytase activity, meaning a minimal amount of phosphorus is likely to be absorbed when eaten. One half cup of cooked millet provides 3 grams of protein, 1.2 grams of fiber, 87 mg of phosphorus, 54 mg of potassium, and 0.8 mg of zinc. Millet is popularly eaten like popcorn, but can also be used in soups, breads, pilafs, or made into a breakfast porridge. For more information read “Including Whole Grains in a Kidney Diet”. 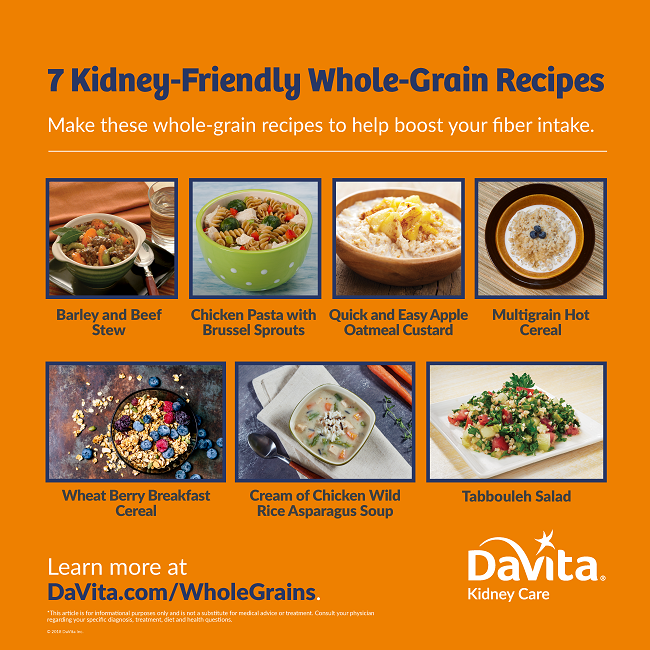 For more whole grain recipes check out “7 Wholesome Whole Grain Recipes for the Kidney Diet”. In summary, whole grains were once restricted on kidney diets based on potassium and phosphorus content. However, over the past few years we have learned more about digestion and phosphorus absorption from whole grains. Now dietitians are encouraging patients to include some whole grains as part of a healthy kidney diet. Moon, Maggie. The MIND diet: A scientific approach to enhancing brain function and helping prevent Alzheimer’s and dementia. Ulysses Press; 1st edition (October 4, 2016). Williams, et al. Whole Grains in the Renal Diet—Is it Time to Reevaluate Their Role? Blood Purif 2013; 36:2.210-214. https://www.karger.com/Article/PDF/356683. I’ve been trying to find a source of information that qualifies whether kidney patients should or shouldn’t take whole grains. This is incredibly helpful. Thank you Erika! So Is the advice for bread the same for rice? i.e does the way the bread is made cause a difference in the amount of phytase enzymes present? Thanks Erika, any thoughts on whole grain bread? Whole grain bread is included in today’s kidney diet. Although phosphorus is higher compared to refined breads we know that only half is available for absorption. Compare labels and go for the bread with highest fiber and lowest sodium for the best choices. This is incredibly helpful to me! I’ve been really struggling with eating healthy when I go out. It’s so popular now to include all these fancy grains in dishes, it was impossible to find something that didnt have brown, wheat, ancient, or wild whatever. Thank you! Where are many brands of millet like Barnard, Finger, Foxtail, Kodo, Little, Pearl, Proso, Sorghum and others. Which of them is the best for kidney treatments? There are many brands available. The issue is often they do not provide information on potassium and phosphorus. None of these are treatments for kidney disease, but can be included as part of a healthy diet. The type, amount and frequency is determined by your stage of kidney disease and lab values. Ask your doctor or dietitian for guidance. Are Foxtile millet, Barnyard Millet, Koda Millet and Little Millet useful for ckd patients on dialysis. Per the USDA database, 1/2 cup of cooked millet contains 53 mg potassium (low) and 87 mg phosphorus (high). If you have it at a meal limit ot 1/2 cup and do not have other ingredients with high phosphorus or phosphate additives. Could anyone help me in answering whether Kodo Millet is better than long grain rice for kidney dialysis patient? I do not have values specifically for kodo millet, but for millet the potassium for 1/2 cup cooked is 54 mg and phosphorus is 87 mg. That is twice as high as 1/2 cup cooked long-grain rice which has 28 mg potassium and 34 mg phosphorus. The calories, carbohydrate and protein are similar for rice and millet. Thank you Sara for your reply. Helped me a lot. Thank you for the recipes found on the DaVita website. They are tasty and user friendly. 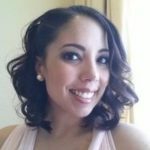 Could you help me reduce my husband’s level of oxalates (makes kidney stones) found in plants and foods we eat? I would like you to develop some recipes/menus low in oxalate and include oxalate in your nutritional analysis. Your website has been very helpful. My husband is at Stage 2 CKD and was diagnosed about three years ago. Thank you.